When I was five years old my grandmother gave me the book entitled This is Paris by Miroslave Sasek, and I knew at the moment I opened it that I would live in Paris one day. It took about 15 years but my junior year abroad arrived and my dream came true. There was a bit of a housing crisis that year in Paris. It was hard for some of us to find apartments. I had paired up with one friend to look for a place to share because that would be a quicker solution, and also more fun in a new city. She ended up finding something with another girlfriend so I had to struggle a bit to land finally in my beloved little studio in the Marais. To this day, the Marais is my favorite neighborhood in Paris, in part due to its proximity to Notre Dame. A brief walk and there she was! My school was on the left bank, across the Seine, so Notre Dame was midway between my apartment and my classes. I don’t know that there was ever a day that I lived in Paris that I didn’t see her. Most weekends I would attend concerts there, but most days at the very least I would walk by her, or the bus would pass her exalted expanse. Every time she looked different. She had personality. I was living my dream and loved every day but this was the year that I also spent more time alone than I ever had in my life. It’s the year I started to figure out who I was without the reflection of other hearts to show me my own. Notre Dame was the caretaker of my heart that year. I spent many hours with her when I was alone. There were many walks between her and my apartment. I am neither Catholic nor religious. I wasn’t raised with religion, but she fed my heart and was my touchstone. Every time I have returned to her since I have thanked her for the love she bestows on us all. How many millions of hearts has she nurtured since she was born 800 years ago? Mine is a common story. Many of us think of Notre Dame as the heart of Paris. 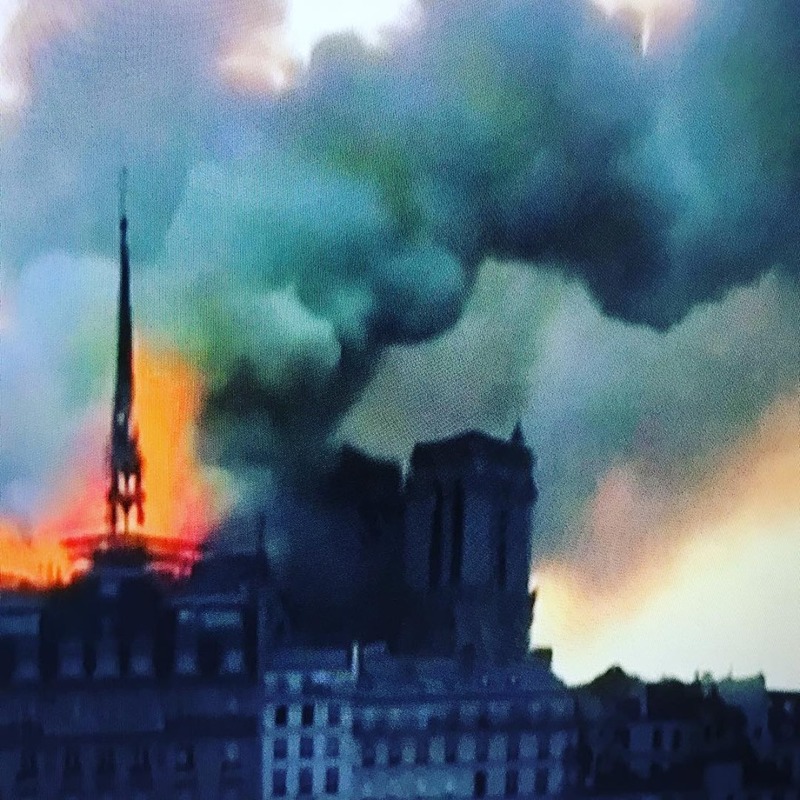 She is one of many heart centers we are lucky to have on this planet, and the shining jewel heart of Paris even as she is surrounded by embers and wreckage. She is a mighty heart. She will rise again. The world will help rebuild her. Yet what a reflection for the world to have this mighty heart burn. Our collective heart is on fire too. Two nights ago I went to an event with Marianne Williamson and Eckhart Tolle entitled “Return to Presence: Becoming a Compassionate, Conscious Force for Change.” Both Marianne and Eckhart spoke about the cross being the symbol of what we struggle with here on earth, the intersection of the vertical and horizontal. We struggle with that intersection of our connection with the divine (the vertical) — our being — and our worldly selves (the horizontal) — our doing. The photos of that which remains at Paris’ heart seem to be eloquently affirming their points. I’m taking it as a call to action to look into my own heart to see what burns, what anger and resentments need attention, to focus on the light that is there. I will heed Eckhart and Marianne’s advice to stay focused on that vertical and trust that the divine is right here right now. And I know that the mighty heart of Paris burns in each of us no matter if her spire reaches for the heavens or falls. What we all love about Notre Dame, what has nurtured millions, is inside us still.